Out of all the dental injuries a person can experience in their lifetime, tooth loss is often considered to be one of the devastating, both to your overall oral health and your sense of self. Many patients who suddenly find themselves with unsightly gaps in their smile often find it hard to even get out of bed in the morning, much less interact with their friends or coworkers due to their fear of being judged or embarrassed. Even worse, missing teeth can cause additional dental problems to crop up, such as sudden misalignments as other teeth twist and shift in order to fill the empty space, an increased risk of periodontal disease, and even additional tooth loss. Of course, traditional tooth replacement methods such as dentures and bridges have been around for countless years, but many patients find themselves unsatisfied with their bulky and artificial nature – not to mention that they still have to struggle with the problem of jawbone deterioration as time goes on. While Dr. Weinman and his staff here in Westfield, NJ can’t rewind the clock on your smile, we can provide you the next best solution: dental implants. With the help of this revolutionary new restorative dentistry method, you can finally experience a truly healthy and happy smile again. 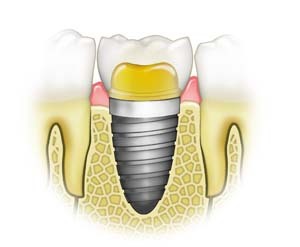 Simply put, a dental implant is a complete replica of your original tooth! While many patients recover from the loss of their teeth with the help of dentures or bridges, these restorations only provide a replacement for the crown section of your tooth (the visible area), not the root beneath the gums. A dental implant is the only tooth replacement option that solves this problem by effectively replicating both the root and the crown of your lost tooth, which protects you from crucial jawbone deterioration and providing a sturdy foundation for your replenished smile. First, you’ll have a small, titanium post placed in the socket where your new tooth will go. Then, once an appropriate amount of time has passed for you to heal from this procedure, you’ll return to our Westfield office, where Dr. Weinman will place a beautiful, customized crown on top of it. Your new tooth will look and feel so stable and lifelike that it’ll be hard to tell you ever lost your original one in the first place! Contact our office today to schedule an appointment! Dr. Weinman and his team are committed to providing patients personalized dental care that puts their comfort first. In addition to Westfield, we also welcome patients from Scotch Plains, Farmwood, Cranford, Mountainside, and beyond.